At Feedwater we have recently made a major investment in our systems and have been working with one of our technology suppliers Polymorph Ltd – a Runcorn based supplier of both Microsoft and Lotus Notes Development services, to look at how we can make our information more accessible to our customers. 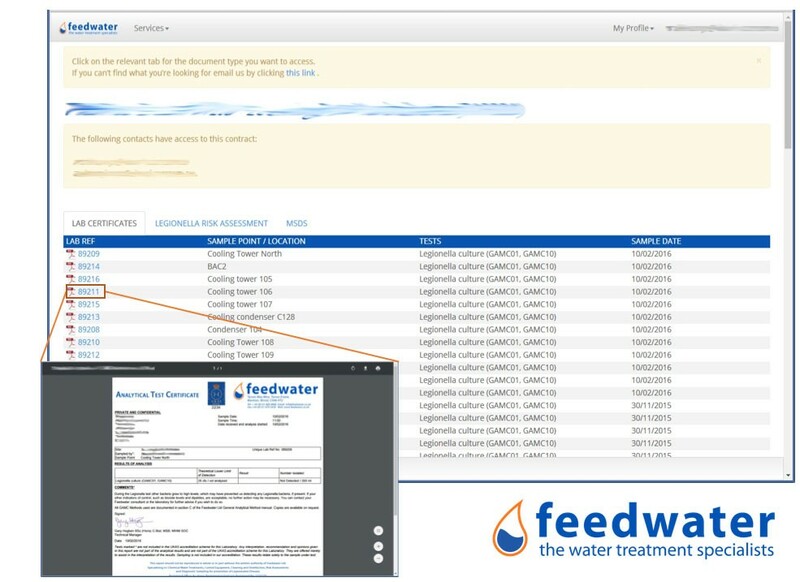 As part of this investment we have recently launched the Feedwater Customer Portal. The portal provides an easy way for customers to access key information relating to the water treatment services we provide for them. The web browser based system allows customers to access their information from multiple devices making it a really flexible solution. Once logged in the customer is presented with a list of the contracts they have with us, by clicking the contract they can then access PDF versions of Lab Certificates, Legionella Risk Assessments, Photo Reports and Material Safety Data Sheets, allowing the customer fast access to a wealth of information. Coming soon we will also be adding consultants digital water treatment service reports as well. This is extremely useful for customers looking to impress HSE auditors by having all historical reports available in a secure location accessible from anywhere with no potential for loss or damage. Beyond the customer specific information, the portal also offers us the opportunity to share resources relevant to all our customers, such as links to industry standard information as well as our own documents relating to accreditations and compliance, offering us a new level of assistance and transparency. As well as offering a great way for us to communicate the information we already have to offer, it provides a solid base for us to provide further materials in the future and allow us to respond to our customer’s needs. Our continued thanks to Polymorph for their incredible support and high level of technical ability developing our Microsoft and IBM Lotus Notes systems to enable us to move forward modernising our services for the digital age. To read Polymorph’s case study on works to reduce our administrative burden view their post here.